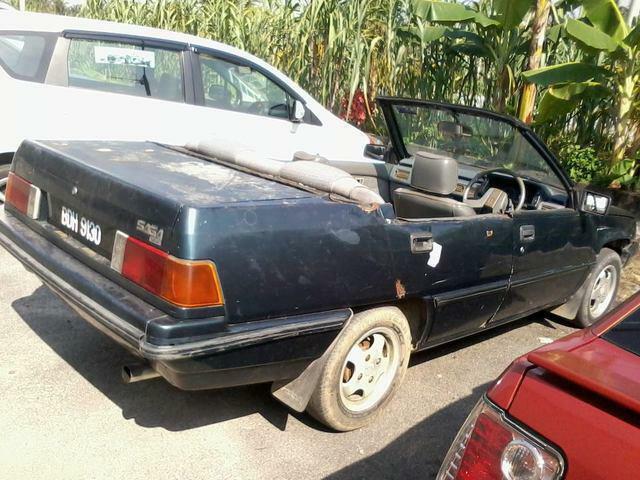 What is so call a convertible car? A convertible is a type of automobile in which the roof can retract and fold away having windows which wind-down inside the doors, converting it from an enclosed to an open-air vehicle. Open cars may have a folding roof but only detachable sidescreens which snap-on, they do not convert into a fully enclosed car with proper weather-protection. The wind-up windows make the distinction between an open car and an all-weather car now known as a convertible. As everyone knows that convertibles are luxury because they are more expensive to build than closed cars, the matching sedans or saloons. However the saga over here is cheaper in term of building it as that is no folding roof attached to it. Besides that, you just need a chainsaw to cut off the roof. You can have it done within a few hours. Anyway, here is a good example of doing it. Hahahah, maybe the owner fedup with the rusted roof. So he/she just chop it off. Welcome to Ben9166! Ben9166 obsessively covers the auto industry with news, reviews, podcasts, high-quality photography, commentary about automobiles and the automotive industry, do it yourself guidelines and car projects. Created By ThemeXpose | ©2018 Ben9166.com. All rights reserved.